It seems the community has been crying out for a post of this nature and so here I am; gallantly riding into the maelstrom of a politically sensitive issue, on the back of my watery steed, wielding my lance of science and wearing my armour of academic integrity. For starters, this is a complex topic. The exact ramifications of river dredging upon geomorphology will be a function of the river typology, sediment characteristics, the dredging technique employed, existing floodplain connectivity and antecedent environmental conditions – the points made within this post are theoretical and generic, just like my post on the geomorphic impact of weir removal. I’d invite you to highlight examples where what I suggest should happen, hasn’t happened. A reduction in bedload supply and therefore channel slope downstream of the dredging activity. A number of studies have considered environmental/water quality/biodiversity issues, but there hasn’t been much focus on lowland systems. With all of these potential changes, why do we bother? In the UK the principal reason for river dredging is flood defence. The notion is that by removing the amount of sediment within the channel you are able to increase its capacity. Lane et al. (2007) demonstrated in their study of an upland, coarse sediment-dominated river that the magnitude of low-frequency (1 in 0.5 and 1 in 2 year) events is increased in river reaches that experience aggradation (sediment accumulation) and therefore reduced channel capacity. 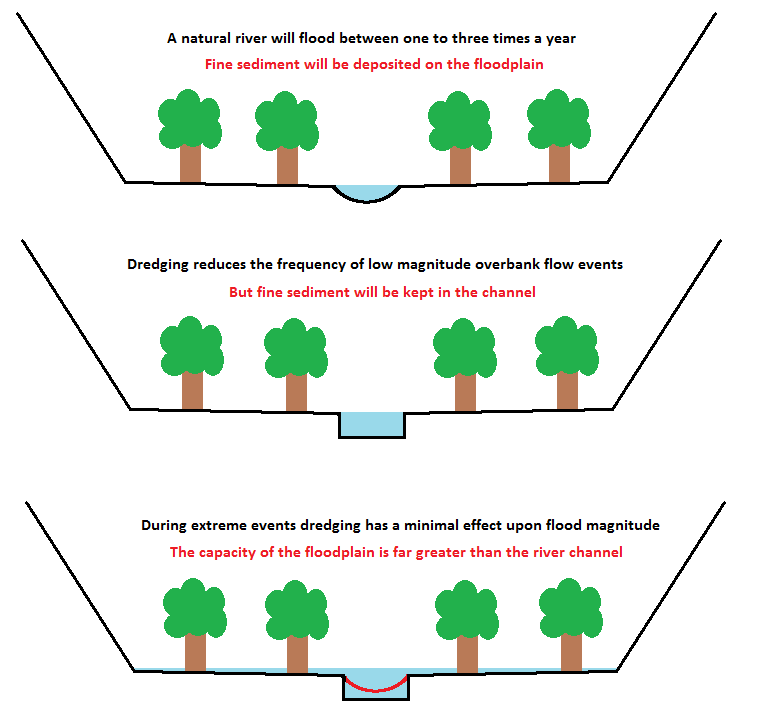 So there is scientific evidence to suggest that the presence of sediment increases flood risk, but it is quite heavily caveated and I’m going to use one of my classic MS Paint diagrams to illustrate why it doesn’t exactly work the other way round – dredging doesn’t always reduce flood risk. 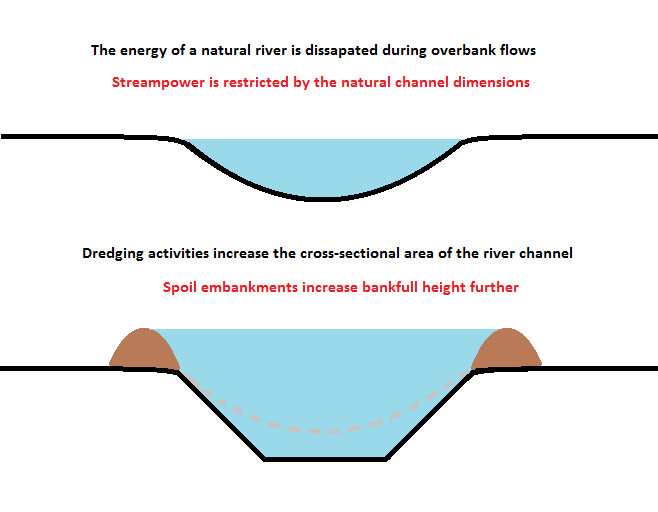 If we assume that a dredging activity increases channel capacity then it can also be assumed there will be a reduction in the frequency of overbank flow events as more water can be stored within the channel. However, during extreme events, perhaps upwards of the 1 in 5 year frequency, dredging is ineffective for flood defence purposes because even a river that has twice the capacity than it would naturally cannot contain a high magnitude flow; the capacity of the river floodplain is far greater than the capacity of the river channel. So dredging has a relatively minor effect on the frequency of big flood events. Dredging can also have a number of unwanted geomorphic consequences. Dredging can have a number of undesirable geomorphic consequences, many of which are detailed above and in an excellent paper by Wishart et al. (2008). Mmom et al. (2012) have shown that vertical incision and bank destabilisation can occur following dredging activities. In the simplest terms this occurs because the energy the river would be using to transport sediment (which has been dredged out) is now acting against the river banks and bed. This can be particularly problematic where spoil material is placed either side of the main river channel, creating an embankment. Embankments can prevent overbank flow, increasing bankfull discharge, streampower and sediment transport capacity. Restricting the river in this way can significantly increase rates of geomorphic change, with greater local erosion and sediment transport during high-flows. However it is also possible that the reach that was dredged may experience accelerated sediment deposition during low flows, particularly where the dredging activity has widened the channel. Fine sediment loads are likely to increase, as the river is unable to deposit this material on the floodplain. Few of these changes are likely to benefit the river system in the short-term and may require further management. So should we dredge or shouldn’t we? Dredging inhibits the natural functioning of the river system and is unsustainable in the long-term. It can act against legislation such as the Water Framework Directive and is costly in a time of austerity and reduced funding for river maintenance. The trick, as my colleague Lucy Shuker put it to me on Twitter, is to realise the value of sediment and to view it as an asset. Gravel has a role to play in providing spawning habitat for fish, aerating water with oxygen by increasing local roughness and inducing turbulent flows. Fine sediment is important for species such as lamprey, whilst the process of floodplain deposition is vital for nutrient transfer between the aquatic and terrestrial environment. As examples, the gravel supports fisheries, which pay their way through rod-licensing and the fine sediment promotes grass growth in water meadows, which provide an ecosystem service in the form of pasture for cattle grazing and improved in-stream water quality. If we’re worried about flooding then what we need to do is stop building in the river floodplain, and not only infrastructure. There is an argument to say that in the long-term, even land that is currently used for arable agriculture will have to adopt a different land-use to accommodate a less predictable climate. Things cannot change over night, but they must change eventually. A gradual, responsive, phased approach that recognises the need to compromise flood defence and biodiversity priorities may be our only option if we are to undo decades of river mismanagement. This entry was posted in Flooding, Geomorphology and tagged desilting, dredging, flooding, maintenance, management, sediment, sustainability. Bookmark the permalink. Hi Trevor, This is a really interesting perspective, and as you say towards the beginning of your piece with the aid of your MS paint diagrams, for big events in simple flood plaines the capacity of the flood plain far outwieghs the capacity of the river. However this theory may not work well for embanked high level fluvial carriers where flood water spills into lowland pumped drainage systems. In these systems flood plain flow is generally not linear or parallel to the river itself, but water is generally stored in compartments of land awaiting evacuation by pumping. In these circumstances you may consider that delaying the onset of peak levels, and advancing the recession through dredging will reduce the duration of overtopping and therefore the volume of water entering the lowland drainage system to be pumped, and with river levels falling more quickly the opportunity to start pumping will presnt itself more quickly. I agree that it is certainly important to understand the geomorphology we are dealing with to make sure we understand the whole life costs of managing sediment, but also to understand the mechanisms of flooding, risks and damages within the areas that recieve floodwater. 21st century floodplaines require enlightened 21st century intervention. Thanks Iain. I agree than in practice there are situations where dredging will be necessary, as outlined in your example. It rarely is as simple as I have described above in terms of flood risk, although the geomorphic response in-channel is likely to be fairly consistent. Attenuating peak flow isn’t something I touched upon, but I can see how dredging may achieve that. I may have used this analogy before but I see modern river management like anthropogenically-driven climate change. We know it’s highly likely we’re causing global warming, but we haven’t instantly stopped burning fossil fuels. We know it’s highly likely that our river maintenance regimes are detrimental to ecosystem functioning, but we haven’t instantly stopped dredging. Neither burning fossil fuels nor river dredging are sustainable in the long-term, and we must seek alternatives. For fossil fuels it’s renewable energy and lifestyle changes. For river dredging it may be managed retreat and floodplain abandonment. I don’t have the answers but its certainly something to think about. People generally don’t like change – especially when they’ve been doing something for so long. I agree about the geomorphological response, and it is essential that this is understood for each case to understand consequences and the need for future maintenance interventions. However, are you suggesting that just because something needs maintaining it is unsustainable ? If so then we as society may just as well give up on roads, railways, telecommunications, housing, food production, health care etc and return to a pre medievil society. The economic and sustainability issues are key. The fact is that we have 21st century flood plains which depend on 21st century river management. 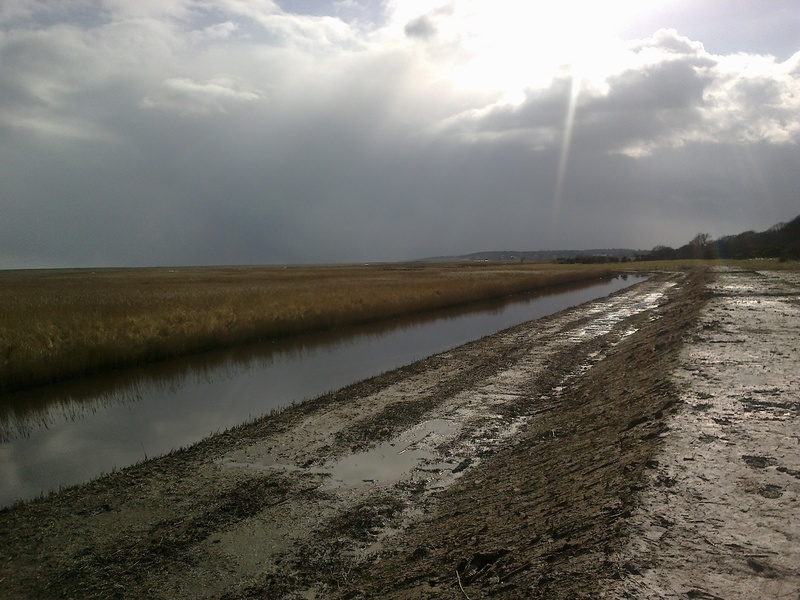 There are of course many less developed flood plains where managed realignment, set back or seasonal inundations could be adapted to and to some degree we are working with this in Somerset, but where there is a truely diverse and dynamic assemblage of modern day uses, including ecology, then sustainability may not be able to take the form of abandonment. That’s a valid point. Some of our systems have been managed in such a way that future maintenance seems inevitable, and I do not believe that maintenace, such as dredging, is unsustainable. If you think about the River Thames and the Thames Barrier – that structure is essential to making sure that one of the most important cities in the world doesn’t flood. As someone who enjoys travelling to London most weekends, I certainly wouldn’t want to see it underwater! But if I carry on my analogy about climate change and fossil fuels – 50 years ago the idea of renewable energy probably wasn’t at the forefront of people’s minds. Nowadays we have electric cars and the development of hydrogen fuel cells. In river management there has been a movement away from maintenance and towards restoration, floodplain connectivity and flood storage areas. Change is coming, it’s just a matter of time. I suppose I just harbour notions of naturalness and returning to a state where we don’t need to periodically dredge rivers 🙂 I am fully aware that this is incredibly naive, but wouldn’t it be great if we didn’t have to maintain drainage ditches? Sustainable might just mean we use geomorphic principles (e.g. shear stress, sediment transport models), rather than diggers, to maintain the useful functions that rivers provide us. Sustainable might just mean natural. I have enjoyed this. Lets see if any other contributions are made. In the aftermath of the last 12 months flooding I suspect it will be a hot topic. Dredging is getting headline attention at the moment. Your idealogical theory to water management certainly is…er…theoretical. England is flooding. We really don’t need to “wait and see” if nature will dredge its own rivers. This may have been plausible before man polluted the world but the only way nature will rule again is if humans don’t exist and in the meantime we really need a mechanical interface to maintain a gentle balance between flooding and nature. Thank you for this informative article Trevor. I am very concerned about the simplistic representation of dredging being the solution to everything being peddled by govt. and landowners at the moment. Thought I should find out more and your article really helped. I come at this from a very different and perhaps ‘alien’ perspective as someone who measured and mathematically modelled diffusion/reaction through permeable systems – but don’t switch off! In these diffusion systems one found that transport of the diffusing species was slowed down when it reacted with fixed sites, and so spent part of its time bound in an immobilized state. Diffusion rates/ transport rates through the system were thus slowed down in proportion to the percentage time spent bound to the fixed sites. Obvious, I suppose when you look at it! Perhaps it’s not so much a matter of removing the water from the flood plane, but more slowing down its rate of arrival. I hope I am forgiven for chipping in on this discussions in a field which is not my own! I know little of this. but there is a reservoir in Wales built to solely protect property adjoining the Severn. I was given a tour. The Reservoir was all allowed to empty in the summer months, then water out was controlled in the winter. As the guide also remarked, if the dam overtopped at any time all control was lost. Slowing the flow in the upper catchment will have some impact, especially in smaller events when the antecedent conditions are favourable. However the Somerset Levels are highly modified and inhabited so the opportunities for naturalisation in the flooded middle and lower catchments are very limited. In the upper catchments Towns with flood defences speed the flow of water towards the levels. There are now over 28000 acres flooded in the Parrett catchment to a depth of 3 m in places. Upstream attenuation in these circumstances can only be ” A drop in the ocean”. Thanks for the arctic very informative. I don’t t see you contribution as ideological, increasing or preserving ecology is should be apolitical. In any case we know dredging wouldn’t have stopped the Sommerset levels flooding, so we have to look at adaptation of buildings etc. Some environmental commentators have talked about reforestation, particularly of upland areas (George Monbiot) and increasing organic matter and reducing compaction in soils (Tony Juniper) as ways to reduce water runoff. Do you think these would make a tangible difference to reducing flooding? I agree that overmanagement of upland areas impacts on catchements. I was involved in a project on a peat bog that showed that the peat acted like a sponge holding on to water and releasing it slowly. Peat in upland areas is often drained to make the land habitable for sheep and grouse. The vegetation is also burned which further dries the land. Draining and burning destroy sphagnum moss which creates the peat in the first place. Once peat is dried water runs off it very quickly into streams and rivers. Blocking these drains and resaturating peatland would go someway to slowing water flow within catchments and would also restore sphagnum habitat aiding peat formation and carbon sequestration. Hi Trevor Bond : I recently cleaned out my house guttering of moss because it was ‘peeing’ ‘contaminated’ water all over the postlady. What would your solution have been please ? Alan, thanks for your considered response. I will forward the findings of your experiment onto the the hydrological community where I anticipate the Dutch and Americans in particular will be only too happy to revise their management plans for the Rhine and Mississippi in light of your experiences with your drain pipes. In the case of the recent devasting flooding of the Thames do you think dredging would have helped ? All this fascinating explanation about slowing flows in upper catchment to allow more sediment in main drain to protect eco systems is total rubbish . Faster flows are the best way ,so without regular cleaning of debris the system is useless for modern agriculture. Since climate is not changing why not simply maintain the land as our ancestors did so well , without our present technology . Modern excavators with lasers can maintain accurate bottom elevation while removing impedimentary silt that can decrease fall throughout the catchment ? Can anyone advise me on these important matters concerning the Somerset dredging ? The reality here is that …it all depends. Dredging of upper catchments or steep channels has very different impacts to mid or lower catchment reaches with low gradients and high sediment loads. The most important thing here is to understand the geomorphology and dynamics of the channel to ensure you understand the benefits and ongoing management challenges. There is no one answer. Dredging is without doubt a suitable management tool in some circumstances but is equally unsuitable in other circumstances. What is most important is that technical experts and sustainability commentators truly understand the context of the catchment before leaping in with generalised advice. our local river is now only 10ft deep,in 1960 it was 30ft deep.there has been no dredging for the past 10 years.surely a 30ft deep river can carry 3 times the amount of water than when it is only 10ft deep.why did they stop dredging 10 years ago? Our engineering operations are diverse and across the main navigable rivers. In particular our experience of the river Thames is that modern understanding is at best poor. The issue we observe is that the river is navigable and cannot be simply left to its own devices with habitat protection taking ascendency. Unless of course navigation and magna carta are now outdated. To illustrate, our data indicates that over 500,000 tons of sediment is transported of which 50,000 tons is deposited each year. Bathmetric surveys of the river clearly show that deposition and scour occur to the river bed throughout the navigation to plus or minus 0.5m between each weir reach. The deposition areas coincide with more flood frequency whereas the scour locations less frequency. Since the halt of full time dredging in the 1980s the depth of the fairway ie the navigable part of the river has become narrower but maintained its depth whereas the edges have become much shallower. In our view reintroducing dredging to the Thames in a co-ordinated manner is part of the solution. Other aspects that are currently absent are managing the energy of the water flows either sides of wiers. Thanks for the comment, you raise some interesting points there. It might be me misreading the last part, but I thought it worth clarifying that the blog is independent of the EA (or indeed any other body or organisation). I think providing data is a good thing, I’m not aware myself about any studies looking at it, but I’ll have a look and see what I can dig out. There are a couple of things that might be worth considering though. The first is the concept of cost – benefit in the context of environmental and landscape issues. We increasingly live in a society that monetises everything and in that respect things which don’t have a clear economic impact will be valued less than those that do. So concepts like biodiversity are something we either value as a society or we don’t, there is no right answer, but it’s important to be aware when we implicitly stack the game board against one option. The other point is the problem that needs to be solved. It’s quite possible that the problem is so obvious you haven’t felt the need! But although you talk about the reduction in deep water navigable width, I don’t get the sense that this has been demonstrated as a clear problem that needs to be solved. I’m convinced you’ve illustrated that the current policy is leading to the width being narrower, but not how this is having a direct and measurable impact on activities on the river. There is no one solution that will be suitable for every river, or every site, but something I always push back on is the inbuilt human desire to manage our environment and shape it, given our ability to do so. Of course this is often very necessary, but it shouldn’t be the default position.